Many people consider themselves lucky to find one successful career path that they are happy and able to take. Gabriel Navarro found two. Navarro now leads MMG Equity Partners, a real estate development company, with his brother and brother-in-law. The company focuses on the ownership, management, development, and acquisition of commercial properties throughout Florida, and already owns more than two million square feet of retail real estate. MMG is aggressively focused on expanding that. Before starting a real estate venture, Navarro already had a career—his family ran a successful chain of drug stores, Navarro Discount Pharmacies. Their thirty-three stores, located through the Miami-Dade County area, generated $330 million in sales. Their success caught the attention of CVS Health, which acquired the pharmacy chain in 2014. CVS acquired Navarro Pharmacies in large part to gain insights from the chain’s fifty-plus years serving Hispanic consumers. Navarro’s focus on the merchandising side led CVS to ask him to stay with the company for two years in the role of chief of Hispanic consumer growth, reporting to the president of CVS Pharmacy. 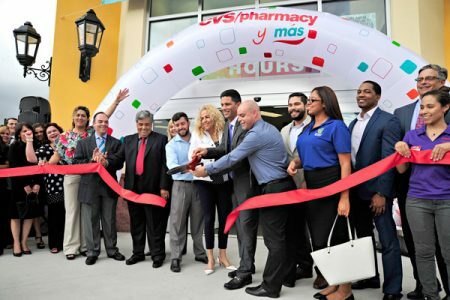 “In this capacity, I focused most of my efforts in helping create a Hispanic-format concept—CVS/pharmacy y más, which combined the best of Navarro and the best of CVS,” Navarro says. The goal of CVS/pharmacy y más is to combine Navarro’s unique perspective of the Hispanic consumer with CVS Pharmacy’s best-in-class pharmacy services in an environment that makes the customer feel comfortable, welcome, and at home. Navarro’s contributions helped the CVS/pharmacy y más concept become a success. Some of the key features include more than 1,500 Hispanic-sourced products throughout the stores, an increased emphasis on value, and bilingual signage and associates in the stores. After a May 2015 launch with the conversion of twelve CVS stores in Miami, sales increased by 10 percent, prompting CVS to expand the test in 2016 to include stores in the Los Angeles metro areas and more stores in south Florida. Helping his family run a successful retail chain helped create a smooth, natural transition to Navarro’s next career—commercial real estate. Growing up in the retail environment, where he was also responsible for identifying expansion opportunities, gave him plenty of exposure through acquiring land for a shopping center development, working to lease the adjacent space, or forging relationship with brokers and real estate owners. This experience made the progression from retail to real estate almost a foregone conclusion. Gabriel Navarro (center) with his family at the opening of the first CVS/pharmacy y más location in Florida. CVS bought Navarro Discount Pharmacy, the largest Hispanic-owned drugstore chain in the country, in 2014. If one were to look at what has made Navarro so successful, they’d have to look no further than his upbringing. His father came to the United States from Cuba alone at the age of sixteen with, as Navarro describes it, $5 in his pocket and started sweeping drug store floors as a way to earn money to bring the rest of his family over. Upon the family’s arrival, his grandfather cashed an insurance policy for $4,000 and, with it, opened a drugstore in Little Havana. Over the years, led by his father and uncle, the chain grew to thirty-three stores prior to being acquired by CVS. Having been on “the other side of the table” as a tenant, he and his family have a unique perspective as they work to bring in retailers to their properties, and many of the same metrics that they used to identify new store locations are the same ones that they use to identify properties that they would like to own. For MMG to continue to build on its real estate portfolio, the formula is simple: continue doing what they’re doing.